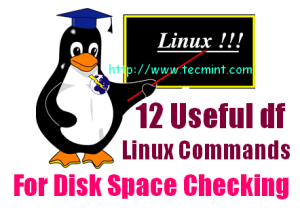 On the internet you will find plenty of tools for checking disk space utilization in Linux. However, Linux has a strong built in utility called ‘df‘. The ‘df‘ command stand for “disk filesystem“, it is used to get full summary of available and used disk space usage of file system on Linux system. Using ‘-h‘ parameter with (df -h) will shows the file system disk space statistics in “human readable” format, means it gives the details in bytes, mega bytes and gigabyte. This article explain a way to get the full information of Linux disk space usage with the help of ‘df‘ command with their practical examples. So, you could better understand the usage of df command in Linux. The “df” command displays the information of device name, total blocks, total disk space, used disk space, available disk space and mount points on a file system. The same as above, but it also displays information of dummy file systems along with all the file system disk usage and their memory utilization. Have you noticed that above commands displays information in bytes, which is not readable yet all, because we are in a habit of reading the sizes in megabytes, gigabytes etc. as it makes very easy to understand and remember. The df command provides an option to display sizes in Human Readable formats by using ‘-h’ (prints the results in human readable format (e.g., 1K 2M 3G)). To see the information of only device /home file system in human readable format use the following command. To display all file system information and usage in 1024-byte blocks, use the option ‘-k‘ (e.g. –block-size=1K) as follows. To display information of all file system usage in MB (Mega Byte) use the option as ‘-m‘. Using ‘-i‘ switch will display the information of number of used inodes and their percentage for the file system. If you notice all the above commands output, you will see there is no file system type mentioned in the results. To check the file system type of your system use the option ‘T‘. It will display file system type along with other information. If you want to display certain file system type use the ‘-t‘ option. For example, the following command will only display ext3 file system. If you want to display file system type that doesn’t belongs to ext3 type use the option as ‘-x‘. For example, the following command will only display other file systems types other than ext3. 12. Display Information of df Command. Using ‘–help‘ switch will display a list of available option that are used with df command. Achtually, if you want to be super correct df -h shows usage in Gibibytes, df -H shows Gigabytes. The difference gets noticeable at high amounts and people are more used to thinking in Giga rather than Gibi no matter how much computer techs would prefer it to be the other way around.